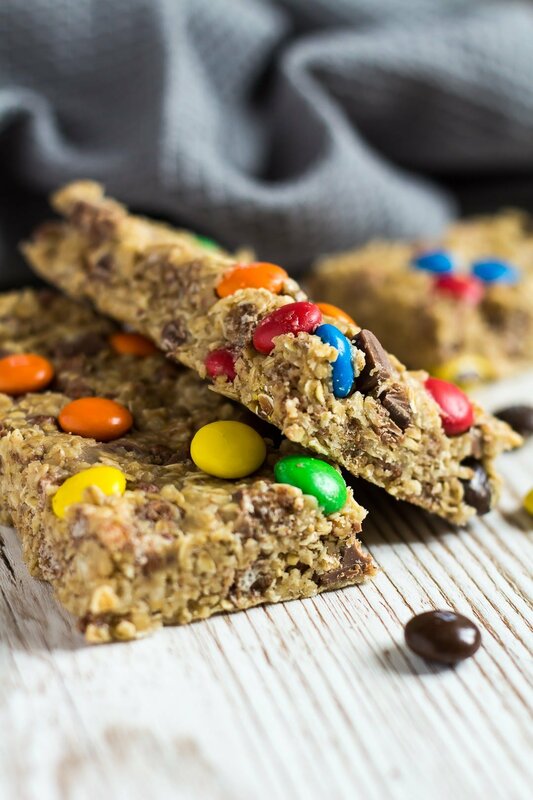 No-Bake Peanut Butter M&M Granola Bars – Deliciously thick and chewy granola bars loaded with peanut butter flavour, and stuffed full of chocolate chips and M&MS! 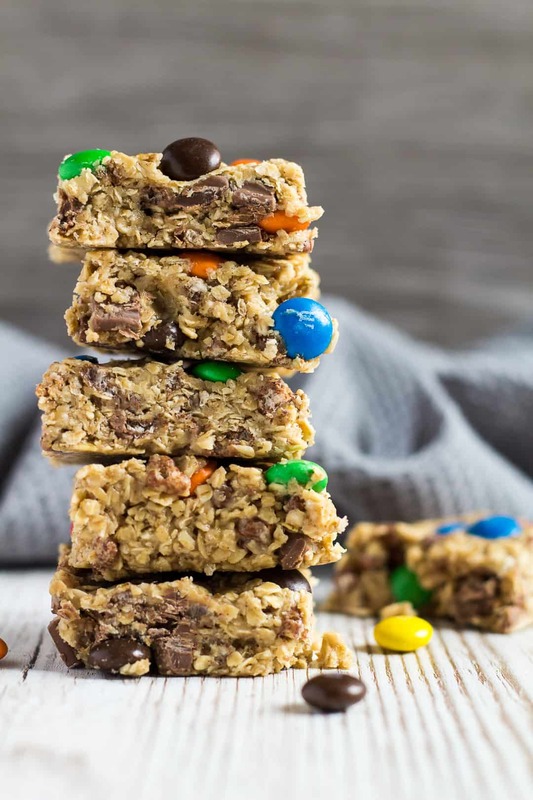 If you’ve tried and loved these Chocolate Chip Peanut Butter Granola Bars, then you’ll love today’s recipe – No-Bake Peanut Butter M&M Granola Bars! No-bake granola bars are a favourite of mine to make because they’re super quick and easy to throw together, and they are very adaptable. You probably have most of the ingredients, right? 🙂 If so, you neeeed to go make these granola bars right now. Because there is nothing better than the combination of peanut butter and chocolate in a scrumptious chewy bar! 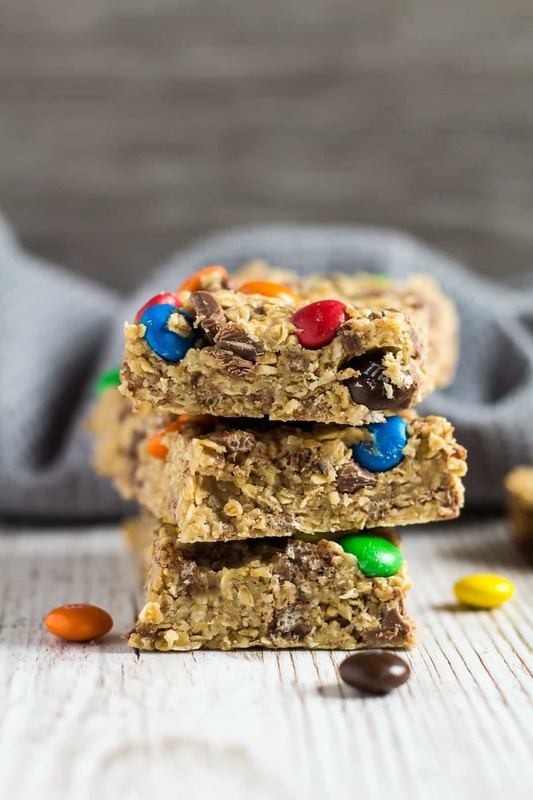 I absolutely love the combination of peanut butter and M&Ms in this granola bar recipe. The crispiness of the M&Ms combined with the soft and chewiness of the bars is just perfection! 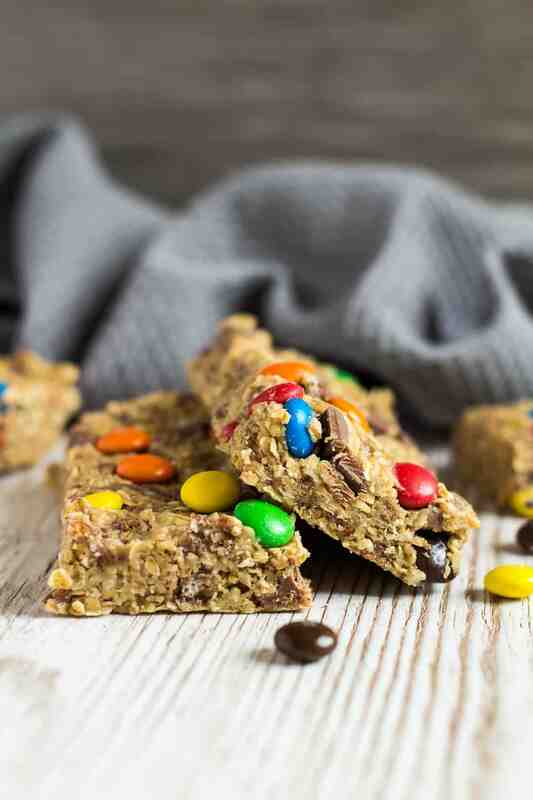 Try these delicious granola bars next! 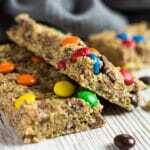 Deliciously thick and chewy granola bars loaded with peanut butter flavour, and stuffed full of chocolate chips and M&MS! Line an 8x8-inch baking pan with parchment paper or foil, and set aside. In a large bowl, stir together the oats, Coco Pops, and cinnamon. In a large microwaveable bowl, add the peanut butter and honey, and heat in 20 - 30 second intervals until the peanut butter is runny and can be combined easily with the honey. Stir in the vanilla. Fold in the oats mixture until evenly coated. Use your hands if you need to. Fold in the chocolate chips, and 1/2 cup (100g) of M&Ms. Press the mixture firmly into the prepared pan (using your hands if needed), then press the remaining M&Ms on top. Cover, and refrigerate for at least 3 - 4 hours before removing and cutting into bars. Leftovers can be stored in an airtight container in the fridge for up to 2 weeks. They also freeze well for up to 3 months. Thaw overnight in the fridge before eating. *For 16 smaller bars, 234 calories each.